Just a quick reminder to let you know that I do still paint and below is a new cupcake painting to prove it. I've listed this one on eBay and it ends next week. You can check out my listing here. A delicious "Black Forest" cupcake with fluffy pink frosting is topped with white confetti sprinkles. 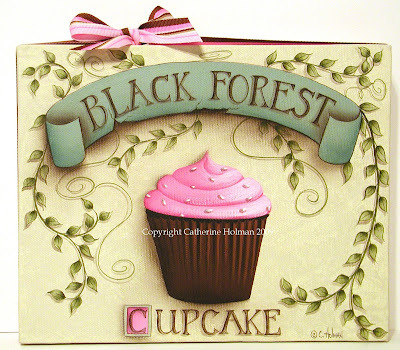 A banner at the top reveals the flavor of the cupcake and branches of green foliage accents the background. A pink and brown grosgrain ribbon wraps around the edges of the canvas and is tied in a bow at the top. I would like to thank all the people who have served in our military in the past and present. Thank you for your service to our country. We also want to remember and give gratitude to those who gave their lives for our freedom. I keep you in my prayers daily. Your paintings are spectacular, as always!!!!! This is a very sweet post with a gentle reminder. I love this sweet painting! Happy Memorial Day weekend. I am thanking all of our military too. How pretty! I'm glad you are getting things done! It's hard to keep up with a blog, too! I figured you were still out there painting Catherine...I love this cupcake...love the nature, the green leaves, the dark rich chocolate and that yummy pink frosting. If I didn't have a cholesterol test coming up, I would gobble this yummy cupcake right up. love this!! As always- wonderful work!! A very blessed Memorial Day to you! Beautiful post!! I just love this painting!! It is really awesome!! It's been awhile since I have seen your blog. Shame on me for that. You are an amazing artist and individual. It's a beautiful cupcake, Cathie! Love it. Looks yummy. Very sweet! I love these. I am craving a cupcake...this is so cute!! Oh my goodness. I want to stick my finger through the screen and scoop up some of that pink frosting:))Really cute. I am doing a giveaway with one of your prints! I had one that I did not get framed and thought someone would enjoy it! I hope that's OK! Let me know! 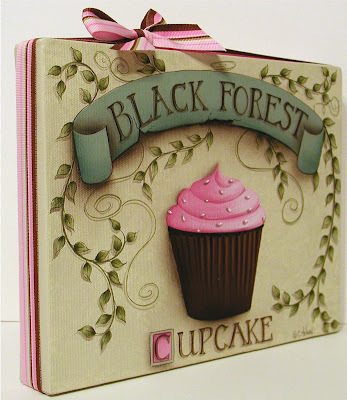 I love cupcakes - your paintings and of course eating the real thing! LOL! Haven't been by in awhile and I have been catching up with you. The chicken sounds so good...m..
Ciao Catherine, your painting are simply wonderful. Your colors, your conpositions... are great! I just love them. I started reading your gorgeous book and made my first "Village scene". Actually it´s a single house. And with your advice it works quite well. I have a photo of it on my blog. And of cause I mentioned your book (with a photo of it) and your blog. I hope that is O.K. The banner and cupcake look as if they are leaping off the painting! I am so sorry I have not been by for a visit. I have missed viewing your wonderful art work. Long time no talk. Hope all is well on your end. Seemed like you have been really busy. I love the new cupcake like always looks good enough to eat!